If you're new to cloth diapers, you may be wondering where you can buy cloth diapers. We've got some great tips to help you find the diapers you're looking for. This is the fun part! Ready to buy your first diapers? Who doesn't love a great deal? We're working with our affiliate partners to update this article almost every week to bring you cloth diaper sales, special discount codes, and cloth diaper savings! Bookmark this page, because we'll help you find a great deal when you're ready to buy cloth diapers! If you're looking for cloth diapers that are easy on the wallet and can help you build your stash inexpensively, don't miss this article! We bring you the names of 6 high quality, cheap pocket diapers, and provide comparisons on sizing, materials, other features, and prices. We also talk about the differences between these diapers and those manufactured in North America, so you know what to watch out for. Looking for new cloth diapers? Start your search by reading this article, which helps identify the pros and cons of purchasing diapers on-line, in person through a specialty business, in department stores, or direct through the manufacturer. "Seconds" are not pre-owned cloth diapers. These are brand-new diapers that have a small defect in the manufacturing, such as irregular sizing, pre-washing, serging flaws, or marks. These flaws will not affect the performance, but the diapers aren't perfect enough to sell to sell at full price. Rather than throw them out, many cloth diaper manufacturers will offer these less-than-perfect diapers for sale at a discount. In most cases, you won't even be able to notice the problem, but even if you buy cloth diapers that aren't quite as perfect, they still work just fine. If you have time and patience to wait for the sales, you can round up some great diapers at an even better price. Although it may surprise you at first, many parents purchase gently used cloth diapers in an effort to stretch their budget or save the environment. As long as you take steps to sanitize them, if you buy cloth diapers used, it can be a great way to test out a new brand, or build up your stash without breaking the bank. This article provides some tips on how and where to buy used cloth diapers. Looking for wholesale cloth diapers? Whether you are thinking about starting up a cloth diaper retail business, or you are interested in setting setting up a buyer's co-op to order cloth diapers at a discount, this article has more details and helpful links for you as you start out. What do you do with gently used cloth diapers when they aren't needed anymore? Whether you plan to sell, donate or re-purpose them, this article is full of helpful suggestions and information. Have you ever wanted to donate cloth diapers to a worthwhile cause? Well you can! We started this directory as part of our Choose Your Charity Cloth Diaper Event. 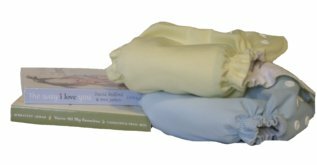 There are lots of great cloth diaper charities that collect new and used diapers to help other families get started while managing the up-front costs of purchasing diapers. Plus, in a second article, we introduce you to a wonderful, local (to us!) cloth diaper charity called Cloth for a Cause, based out of the Greater Toronto Area, that we will be supporting. When you follow a link from our site to a cloth diaper retailer or manufacturer's site and then make a purchase, we usually make a small percentage of your sale... and we use at least 25% of that to support cloth diaper charities. If you're looking to support the local economy please check out our listing of brands that are made in Canada or the USA. Many of our fantastic cloth diaper choices are made right here in North America! Please consider supporting our own entrepreneurial moms-turned-businesswomen who are doing their part to give back to their own communities and support the worthwhile pursuit of cloth diapering! To qualify for our listing, the products must be assembled in the country of origin.